I Shall Wear Midnight is the final book in the Tiffany Aching series, as well as the first young adult Discworld book that I have read. True to form, Sir Pratchett does not disappoint. The book practically bursts with magic, mischief, and laughs galore. There's also a measure of moral lessons thrown in too. The story kicks off with Tiffany Aching taking on the burden of being the witch of The Chalk, just after finishing her studies with the more senior witches. As she runs around caring for everyone else but herself, she begins to discover that something is causing people to start being suspicious of witches. And whatever it is, it seems to be after her. With the (sometimes unwanted) help of The Wee Free Men, she must find this source of evil and destroy it, before it destroys her. If you've read any of Terry Pratchett's books before, you would be familiar with his trademark humour. So a word of warning, this is the darkest Discworld book that I have read so far. It contains references to domestic violence and alludes to prejudice (fortunately, there's no 'burning at the stake', but...), so it's definitely for the older kids. However, as I mentioned earlier, there's definitely a lot of comic relief in this book. The Wee Free Men practically steal the show with their drunken shennanigans; Nanny Ogg kicks off a party at a funeral; and some cameo appearances from other Discworld characters are wonderfully delightful. Though the last book in the series, it can easily be read as a standalone. For those who haven't tried any of the Discworld books yet, I highly recommend that you start of with either Men at Arms, Mort or Night Watch. Happy reading! I just read Good Omens because I love Neil Gaiman's work, but I don't think I've read anything by Terry Pratchett before. Do you feel that this series is his best work? I haven't read any Terry Pratchett or Neil Gaimen...but they've been popping up everywhere lately! I think it's a sign! 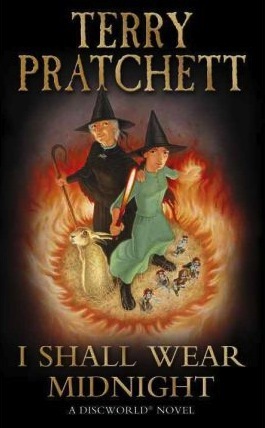 I haven't read any Terry Pratchett either. A few years ago a friend gave me a copy of one of his books but I still haven't read it yet... I've always heard good things about these books though so maybe I should give it a try! This is one of the Discworld novels that I haven't read. After reading your reveiw though, I will definitely put in on my wish list.